Editor's note: this is a guest post by Augustin from content26. content26 is a successful and incredibly interesting business in the world of product content development, and since we're very concerned with high quality product content at Salsify we're very excited to have his contribution. Here's a hypothetical situation. You have a clean, user-friendly website. You have great marketing, targeted email campaigns, catchy slogans, and other branding necessities. You have assets for all your products. Some of those assets show up on your website, some don't. You're done, right? Wrong. Don't think that because your product pages have photos, technical details, and buy buttons, you can rely on your marketing and promotional efforts to sell your products. "Content" is a broad category. Content marketing is a good (and essential) start, but content merchandising is what will ultimately drive your sales. To better explain that, let's break content down into three types: stick, drive, and convert. I know that sounds like a rallying cry from Game of Thrones. "Stick. Drive. Convert. Stick! Drive! Convert!" But it perfectly describes the content any successful brand will produce. Stick: This is the first stage of content creation. You want your branding or messaging to stick with your customers. Drive: Better known as the call to action, this is the second type of content you need to create to successfully sell products online. This includes landing page content, email campaigns, and banner ads. Convert: This is product-detail content, where you seal the deal. At this point, it's all about the product. Not your company, not your responsive design, not your slogan. In this post, I'll be talking about content that converts. Content that converts will inform, not persuade. It should offer a complete picture, not a tantalizing tidbit. We call it product-detail content for a reason. So how do you turn your assets into product-detail content that sells? The short answer is: pay a writer or agency to create one-paragraph descriptions of your products. Armed with tech specs, lifestyle shots, and descriptive phrases from product assets, it doesn't take long to produce an informative 100-word paragraph about a product. If you're selling on multiple retail channels, create unique descriptions for each major channel. This may seem pointless, but I assure you it's not. Retail sites with unique content will get higher page rankings, more page views, and more consumer respect. Brands that provide informative multichannel content will see sales increase, both online and offline. Creating content for individual platforms allows you to meet site-specific style requirements. More importantly, it allows you to control your brand messaging and appeal to the unique groups of customers each site attracts. Once you're on board with unique, informative product descriptions, invest in enhanced, or A+, content (at least for your highest-selling products). 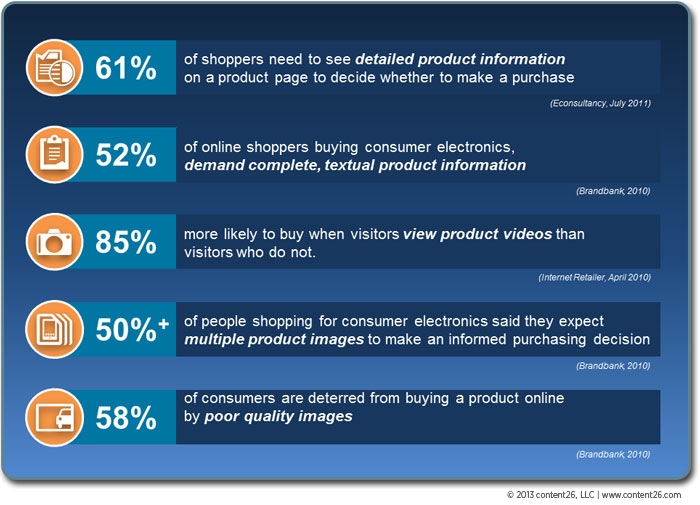 Enhanced product pages should provide all the information consumers need to make a buying decision. Studies of how people use the Internet consistently show that readers want facts, and fast. A recent article from the Nielsen Norman Group stresses this truth: "Emphasize facts. There's so much blah-blah on the web that straight talk stands out." A product-detail page needs to make up for the fact that shoppers can't touch or visually inspect the product. Headers, informational text, feature bullets, and lifestyle images make it easy for shoppers to answer their questions about your product. Including these different elements also guarantees your pages will appeal to a wider range of consumers. Headers: Keep them short and to the point. Consumers should be able to scan headers and come away with a high-level view of the product's basic features and benefits. Descriptive text: Cover important product features with factual, concise language. Don't recycle your marketing materials or packaging text here. Feature bullets: Highlight the product's most important features and benefits. Shoppers who don't have the patience to read the whole description will check out the bullets to make quick decisions. Images: Close-ups and lifestyle images help consumers visualize your product in action. Package contents: Listing everything that comes in the box is sure to reduce return rates and negative product reviews. Depending on your product and the retailer, you may also want to include video or other rich media elements and a comparison chart or matrix (some retailers allow these, some don't). Numbers are hard to come by, but content26 clients overwhelmingly have positive feedback. O3 USA saw online sales triple and return rates decrease significantly after launching enhanced product pages on a major sales channel. And SanDisk's Senior Channel Marketing Manager said, of an enhanced page created by content26: "Clip Zip is one of our top sellers on Amazon, and a lot of its success is because of the A+ page." Your marketing efforts bring customers to you, but your merchandising is what will seal the deal. Present your product information clearly. Don't make your customers work to find answers to their questions. In the end, your content will drive your sales and keep customers coming back.